Clipper Pearls - a formidable industry leader in Australian Pearling! Clipper Pearls runs 2 Pearl Farms, an ocean based farm north of Broome, Western Australia and Elizabeth Bay north of Darwin. For more than three decades Clipper Pearls has established a reputation for providing an annual harvest which is consistently ranked among the world's finest. At Clipper Pearls we nurture our pearl oysters in the turquoise and nutrient rich waters of the Indian Ocean and now the Arafura Sea. We are renowned as the producers of Australia's finest and most lustrous Australian South Sea pearls produced from the pearl oyster Pinctada maxima are endemic to the waters of Broome. Larry House and Mark Walsh, both pearl divers and pioneers of hatchery reared pearl oysters, established Clipper Pearls in Broome in 1988. In 2005 Clipper Pearls acquired Dampier Pearling Company and then in 2006 became part of the Autore Group. The new Elizabeth bay pearl farm was added to the business in October 2018. Clipper Pearls is committed to increasing the profile and growth of the company into the future. Clipper Pearls prides itself on providing pearls that are high in lustre with pink or silver white hues. We are dedicated to preservation of the environment, which is a key ingredient to achieving the gem quality attributes of our pearls. Clipper Pearls is committed to improving the size, shape, colour and lustre of our pearls and you can view our finished product here. Clipper Pearls is also a supplier of Mother of Pearl Shells and Pearl Meat. Our headquarters is based in Broome, which is a major regional centre in the remote Kimberley District in the north west corner of Australia. 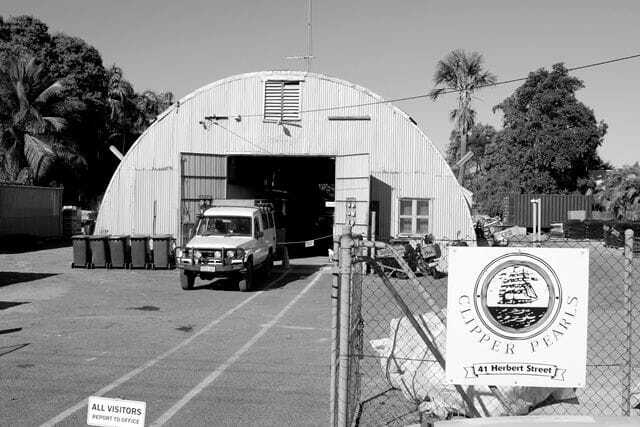 Our administration and farm support is located in an iconic nissen hut in central Broome. Our Farms are located 50km north of Broome in an area known as Quondong Point and the other at Elizabeth Bay 623km north of Darwin in the Northern Territory. The Broome farm was our first farm and is an open ocean pearling lease (the first in Australia used for seeded shell husbandry) and lies 5km from the coast. Elizabeth Bay is located north of darwin surrounded by small islands that give the bay protection from the open ocean making it an ideal place to grow pearls. Clipper Pearls main area of operations is at our Elizabeth Bay pearl farm while our Quondong Point farm is used mainly during the drifting season and resting the oysters before their journey Elizabeth Bay. Elizabeth Bay is an excellent site providing a land base for the crew to live at while providing easy access to the farm. Our mothership, which can move from site to site according to the annual farming production cycle serves as an accommodation and a working platform, as well as providing basic domestic services and a crew recreation area if required. The mothership has dedicated live shell tanks used for the farming husbandry processes, shell seeding and transport between locations. Purpose built seeding or operations room allows technicians to perform first seeding and harvest operations in hygienic and controlled conditions. Crew rotate to and from Elizabeth Bay on a 4 week on 2 week off roster. At any given time, there are an average of 20 to 30 workers at Elizabeth Bay and other farm lease sites. If you are interested in a career in pearling with Clipper Pearls click here.